Basic Package includes: 7 1/8 quart stainless steel bowl, dough hook, dough roller, scrapper and spatula, beater bowl, balloon and cookie whisks, 7 years warranty. New Chrome front panel Knobs and easy grip tension knob for arm. Hurry and get yours now while quantities last. 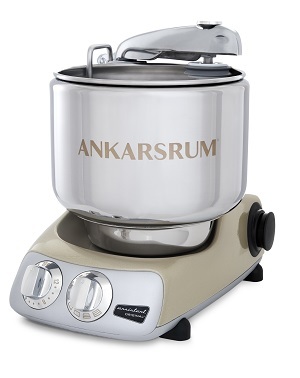 Ankarsrum Assistent Original Mixer Sparkling Gold 6230: Technical Specifications Data – Output: 600 W on 110/120 V • Height/Width/Depth: 360 mm x 268 mm x 400 mm. • Weight: 8.6 kg • Continuous speed control. • 12 Minute timer. • Overload protection. • Capacity: 5 kg (11 lb) dough or 1.5 litres (7 cups) of liquid dough. Mixer Features: • Modern styling. • Continuous timer and speed control. • Unique gear system located under the bowl giving it extreme power for the wattage. • Speed sensor adjusts speed to load. • Overload protector. • Open bowl design for easy cleaning. • Motor, die casting and assembly all done in same factory. • European design and manufactured. • Smooth quiet operation. • Unsurpassed strength and durability. • Backed by more than 60 years of reliability and service in European kitchens.